Everyone looks forward to the holidays, but most of us dread shopping for gifts for the very same holidays! Well, if there is one thing both the old and young like to do, it is to read. What is the best way to read, however? In today’s technology driven world, everything is just a touch away. The same goes for reading. Books are now considered low tech and no one really wants to sit at a desk. What’s the answer then if you want to gift someone something they truly love and enjoy? Look no further. All you need to get them is an EReader. An EReader is a fantastic gift for anyone with a passion for reading. EReaders are great devices which are more convenient and comfortable than using either a smartphone or a tablet. They may be limited in their function and form but are healthier than using other devices. EReaders use e-ink displays which both feel and look just like printed text. Now that I’ve got you sold on the idea, let me tell you about some of the EReaders that make for great gifts this holiday season. Barnes & Noble Nook Simple Touch with Glowlight: This EReader may not come equipped with the best lighting technology that other EReaders have, but design wise, it leads the list. The Nook is small enough to fit into a bag, purse or even a large coat pocket. The Nook Simple Touch has a 7” touchscreen which is easy to navigate. It also comes equipped with four buttons to turn the pages. These four buttons are located on the each side of the device, there are two buttons one each side. Many advanced EReaders have done away with these mechanical buttons however, they are easy to grip and press and would perhaps make Grandpa more comfortable using the Nook. It is a simple EReader which just about anyone can use. It is a responsive EReader and turns pages very quickly. Using the Glowlight on the Nook Simple Touch takes the pleasure of reading up to another level altogether. It is simple to turn the light on and off, all you need to do is activate it through the on-screen menus. Another way of doing this is to just hold the home button for about 5 seconds. All in all, at $120, it’s a good buy this season. Kindle Paperwhite: The Kindle Paperwhite is a great EReader that you can pick up this year. It has a higher resolution (62% more pixels) and better light than other EReaders currently on the market. 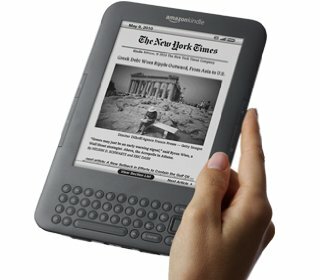 The company boasts of it being the world’s most advanced EReader. Here are some of the features you can expect with the Kindle Paperwhite. It has an 8 week battery life (with the light on too) – enjoy uninterrupted reading without the hassle of having to recharge the EReader. There is no glare at all with the images and you can expect crisp, clear text while you are reading. It has 25% better contrast for darker and sharper text. Select the font you like and the size as well. There are 8 adjustable sizes and 6 fonts on the Kindle Paperwhite. Download books in 60 seconds thanks to the built in Wi-Fi it comes equipped with. Choose from over 180,000 Kindle titles which include children’s books as well. The New Time to Read feature will analyze your reading speed and predict when you will finish the chapter you are on. Priced at $119, you can’t go wrong with giving a loved one this for the holidays. Well, there you have it – two amazing EReaders that will solve your dilemma on what to buy friends or relatives. This guest post is brought to you by Nicole Wilson of cabletimenyc.com, a site that offers savings and current information on time warner cable locations nyc.